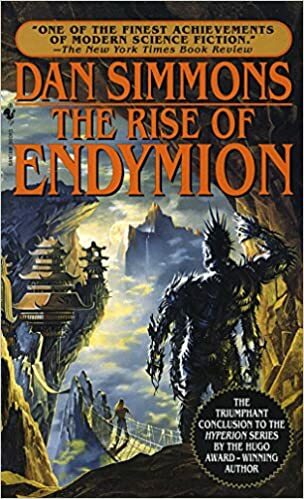 This is the final book in the series, check out my review of the other three – Hyperion, Fall of Hyperion, Endymion. This is a nearly seamless continuation of the story from Endymion. Raul, after having separated from Aenea, continues on his own journey with the end goal of meeting back with her as planned. Captain de Soya is brought out of exile and commanded to continue his pursuit of Aenea as the Pax, the Church, and the Core all seek to capture her. As the final story in the Cantos, this is where they all come together and finally meet, and the story concludes with two big twists, one is you didn’t see coming, and the other, which was underwhelming, see below if you don’t mind spoilers (if a book published over 20 years ago fall under spoiler protection). The beginning of this book is so smoothly integrated to the prior in the series that they must have been written together. That being said, he may have intended this book to be two. For one, it was over 700 pages, but striking, it seems rushed at the end. By the last quarter of the book, he has over 2,000 pages of story written, and the story-line endings are wrapped up much too quickly. This is particularly true with the Shrike and the final scenes of Aenea. After being the focal point, in some ways, of the first two books, the Shrike might as well not exist in this story. He plays a few roles in the early and middle parts of the book, but this is essentially written out. This might have been by design, but it is left up to the imagination exactly who/what he is. We know he is from the future, and seems to switch sides, but it never become clear who actually sent him. His ending doesn’t necessarily feel rushed as much as it does that the whole of the story and Simmons himself, just moved on. The other issue I had, and this was certainly due to rushing, was the ending with Aenea. At this point, we are four books in, thousands of pages, and we are clearing reaching the apex of the story arc, and then, it is just…over. The attack, they fail (as she states throughout the book, so not a spoiler) and she dies. It is maybe a few pages and very much anti-climatic. That’s not to say the book isn’t worth reading, it is a great book, I enjoyed a good 500-600 pages of it, but it is just a bit rushed at the end. On its own, I might rate it at three (maybe a four, as there are some trippy sci-fi thoughts in here, such as falling in a gas giant planet, and how long you can fall and still be in the atmosphere), if you are looking for something, but if you’ve read the other three, you have to finish it. It really become a must read. There are two twist/surprise endings as I mentioned above. I’ll start with the bad, the future time that Aenea and Raul spend on Earth. It was just kind of dumb. You start to see it coming, especially the more they talk about her child and how she can’t talk about it. The bigger issue is, it doesn’t work with time travel. That doesn’t need to be so many months, it can appear as a second, because it doesn’t actually exist in regular time. The other twist was incredible, did not see it coming at all and is maybe worth these two books on their own. Simmons could have developed the idea of Watchers a bit more, or gone into some more, like I said, he seemed a little rushed, but having A. Bettik be one, was just brilliant writing.